Seems to be a good time for a seasonal photography tip. 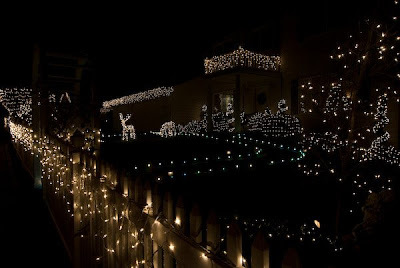 Millions of pictures will be taken this holiday season to memorialize the creative light displays of dedicated (and occasionally fanatical) artists of the Christmas bulb. Situations like these often result in disappointing pictures due to the unusual light conditions. Shooting Mode: Aperture priority to control depth of field. 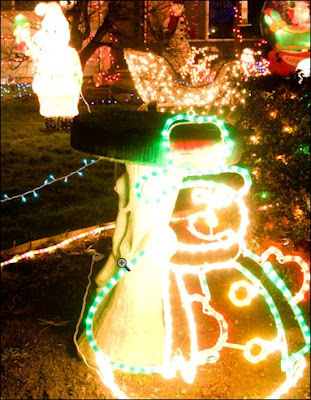 Lighting display pictures present some interesting photographic problems. The picture above is typical of the results in these unique lighting environments. Although the scene has been captured, the highlights have been overexposed and contain no details. The result is the visual "fusing" together of the individual lights that make up the display. The picture above is an enlarged section of the first image. 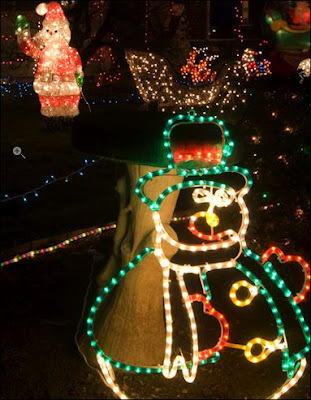 Notice the lights that provide the detail in Santa and the snowman have merged to produce an over-exposed mass of white. The metering problem is created by the amount of dark area in the scene and the extreme intensity of the display lights (the scene's high dynamic range). The camera's metering is attempting to provide an exposure setting that will produce an overall exposure value that is equivalent to 18% gray. In most cases, the amount of dark area is greater than the light areas and has the greatest influence on the camera's metering system. As a result, the camera determines settings that over-expose the display lights. 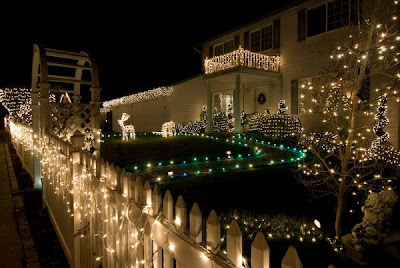 The goal should be to distinguish the individual lights that make up the scene. The picture above has been exposed for the display lights. Notice that the individual lights and their colors are now distinguishable. 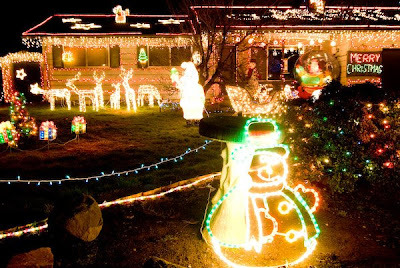 The strings of lights have also provided enough illumination to allow some of the house details to be seen and add structure to the image. Now the individual lights and their colors are visible to give the image the details in the displays and colors of the season. I elected to intentionally under-expose the image by 2 stops using the camera's exposure compensation control. How did I settle on 2 stops? The camera's preview screen. Watching the preview image I was able to see the results of each trial exposure and "see" the impact of exposure compensation changes. I was looking for the setting where the individual display lights became recognizable. The camera's histogram. By watching my preview image and ensuring that the curves were not pushed too far to the right border of the histogram. Notice anything? The exposures for this example are exactly the same as the first example. The point is that there is much similarity between displays. The exposure settings determined for one display become an excellent starting point for others. There are many ways of taking these lighting display pictures. Other photographers might have elected to use a high ISO setting (in the range of 1,000 to 1,600 for example). This is a very workable suggestion when you don't have the luxury of using a tripod and must hand-hold your camera. These higher ISO settings will provide faster shutter speeds. At the same time, just be aware that "noise" will become more apparent as the ISO values increase. Snow is your friend. 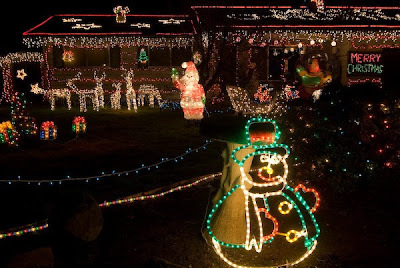 Unfortunately, in my area of the country, snow seldom falls during the holiday season. If you are lucky enough to shoot holiday displays with snow on the ground, you will be the beneficiary of additional fill light that is being reflected from the snow. This provides more structure to the picture and, obviously, more of the appropriate holiday mood. Over compensating for the lights reveals the details in the display but loses the structure provided by the house. I hope this short discussion helps make your holiday pictures more successful and enjoyable. Happy holidays from Hub's family to yours. You talk me out of my soul. Very good explained.